To kick off a week of travel-themed posts, I'm teaming up with Radisson to offer a two night stay at any of their North American locations. 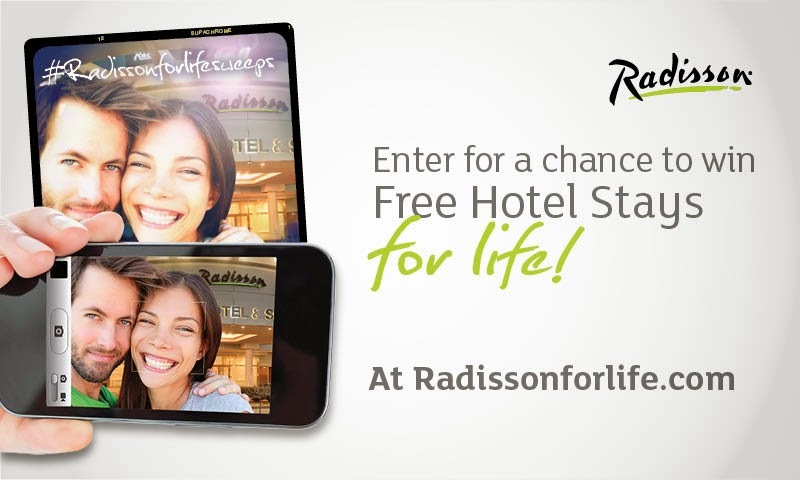 This is to help spread the word about their amazing sweepstakes going on right now, where one winner will receive free hotel rooms for life, via Radisson. So cool! Today on Sometimes Sweet though, I'm giving away two Radisson vouchers, each redeemable for one night in a standard room, double occupancy. My family and I actually did a little staycation last year at a Radisson down by my parents' house and had the best time. Clean, spacious rooms and definitely family-friendly...thinking about it makes me excited to see who the winner will be! To enter, see the widget below. Good luck- this contest is open worldwide. I haven't been to the beach in so long, I'd go to San Diego! Thanks for the chance! I would love to go to portland, OR. I'd love to get back to Seattle for sure! i want to go to seattle to see ryan adams for my 30th! I'd go to Atlantic City! I live in Ohio and have never been out west. I would love to experience Cali! I could use a nice staycation. I would love to win this! I'd like to go to Anaheim! I would love to head to California and take my girls to Disneyland! I've been dying to go to Portland! I want to go to New Orleans. I have been hoping to take my lil lady to NYC for her time! I'd love to go back to Chicago! I would love to go to New York by the end of the year, or stay in the Radisson on my cross country moving trip! I haven't been to New Orleans yet! Florida to visit family, with a Legoland trip on the side! I would like to go to Philadelphia. I'd travel anywhere to make more memories with my little family!! Such a great giveaway! My husband and I want to road trip through the Great Smoky Mountains! we'd love a few nights at the beach this fall i think ! My family loves to travel! This would be great! I would love to Visit Portland, Oregon. I'd love to go to San Francisco! i would love to go back to colorado! we had such a good time in the mountains there! After devouring House of Cards on Netflix, I totally want to go to Washington DC and see all the national landmarks there. I would love to go to Chicago! Would love to see Boston! My sister and I want to go to Portland! I'd stay in Los Angeles! Anywhere!! Would love to have a weekend away with the hubby! My fav city - Boston! Gosh, where don't we want to go? Denver, Arizona, Maine, Alaska...yes please! I'd like to go to Charleston, SC. I'd love to go to NY again! San Francisco is my dream destination for (too many) months now! Maybe upstate New York or Michigan! I don't even care where I'd go--I just want to go. :D Thanks for this opportunity! I would like to go to Disney world. Florida - hot, sunny, East coast goodness! I would LOVE to visit Boston. I have never been but heard it's beautiful and SO much fun! mm, Hawaii. Where else is there...? Hawaii, is there anywhere else??! My husband and I have a wedding anniversary coming up and a little night away would be amazing! Awesome giveaway!!! I'd take my boyfriend to DC for his 30th! Such an awesome giveaway! I would to do a mini staycation with my husband! Nothing better than viewing a breathtaking Skyscape, would love to travel to Denver, Colorado - to see the snow capped mountain peaks. Breathing ice crystals with cheeks aglow and exhilarated on being alive...this would be a dream vacay spot for my family. San Francisco! I love that city! I would love to go to La Jolla! I would love to go to Kona! I'd visit in Denver, Co. I would love to travel to fort worth texas to see my sisters and brothers who I haven't seen in a while. I'd like to take my family on a last hurrah weekend to Myrtle Beach before school starts! I would like to go to Miami. West -- specifically Colorado. It's been years since I've been out that way and I'm itching to return to the mountains. This would be a dream come true! I'd love to visit the North West. But honestly, it'd be so hard to choose where to go!! I'd probably have to pick out of a hat! Oh there's one in Philly about an hour and a half away from us - would be the worst weekend away for us once we can leave our newborn son with my parents for a weekend! I am dying for a vaca- I'd go to San Diego! I'd really love to bring Essley to visit my best friends in San Francisco, but I'd be thrilled with a staycation here in Chicago too! This sounds amazing, what a great competition! I would love to go to COlorado! I would love to travel to Arizona or Montana to visit family! San Diego or San Francisco! We'd like to take a trip to Columbus, Ohio. I just came back home from a month long roadtrip through California, but there's so much left to see. So probably San Francisco. I'd love to go to New Orleans! Portland or Seattle, especially because of your PNW trip! So many places! San Diego, for one (inspired by your recent trip!) but also Austin, Colorado, Seattle, and New Orleans! So many places! San Diego, for one--also Austin, Seattle, Utah, Colorado, and New Orleans! I would travel to the Anaheim, CA area to visit my family and go to Disneyland! I want to go to Branson, MO. I'd love to head back to Miami! Up to Washington to see my best friend. To Detroit - so many great things to do and Detroit could use the love! I would got to Fort Worth Texas, I already has commented but it is no longer here. Not sure what happened.